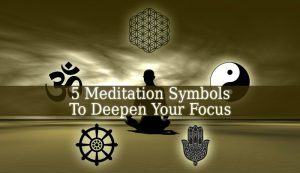 Meditation Symbols – are spiritual symbols used in different cultures and religions. These symbols are widely used for their powers and energies. Meditation Symbols are very powerful and they are also very useful. They can improve your meditation sessions. And they also give you a focus point or a purpose to your meditation. Many people use these symbols as something to contemplate on. Or an object to concentrate on, resulting in a state of mindfulness. The “OM” Symbol – it is the most popular symbol in the spiritual community. It is not only a powerful symbol to focus on, but it is also a very powerful mantra. It is the origin of every mantra. And it is the first sound of the Universe. It is one of the most powerful Yoga Symbols. The Yin Yang Symbol – it symbolizes the harmony of the universe. It also represents duality. Therefore, it symbolizes the contrast between good and bad, feminine and masculine, etc. It represents the balance between two opposites. So, this symbol is useful in meditations for harmony. The Dharma Wheel – also known as the Wheel of Law. It contains the teachings of the path to enlightenment, in Buddhism. It helps you to reach Nirvana. The wheel contains Buddha’s Eightfold Path to Enlightenment. Each spoke is a step. This one of the Meditation Symbols is very powerful. And it leads to spiritual awakening. If you are a fan of symbols, you might want to find out which is the most powerful Archangel Gabriel Symbol. The Flower Of Life – It is a powerful Kabbalistic symbol. And it is the most important symbol in sacred geometry. It contains the patterns of creation in it. This symbol is the most largely used in the ancient civilizations. The most ancient symbol, it was used even by the Sumerians. The Hamsa – it is a largely used symbol to ward against negative energy. The Hamsa is as a palm with and eye in it. It also contains different designs, depending on the culture and artist. This symbol is also used for luck and health. Because it wards against the “evil eye” which causes unluckiness, disease and even death. These Meditation Symbols are not only very useful and powerful, but they also have very pleasant designs. Therefore, they are often used as design elements for meditation spaces and altars. And those who are into spirituality, often choose them as designs for tattoos.